Here, what struck Brown when seeing a field at Hendon (he and his wife Alice were staying in Finchley at the time, and taking excursions into the surrounding countryside) was the perspective of turnip field and hayricks, farmhouse, sky and sun. He also mentioned a steeple, but that does not appear here (see Treuherz 168). It was a difficult subject, changing on every visit both because of the light and weather, and the farming activities, and he ended up going there again and again to try to get it right. 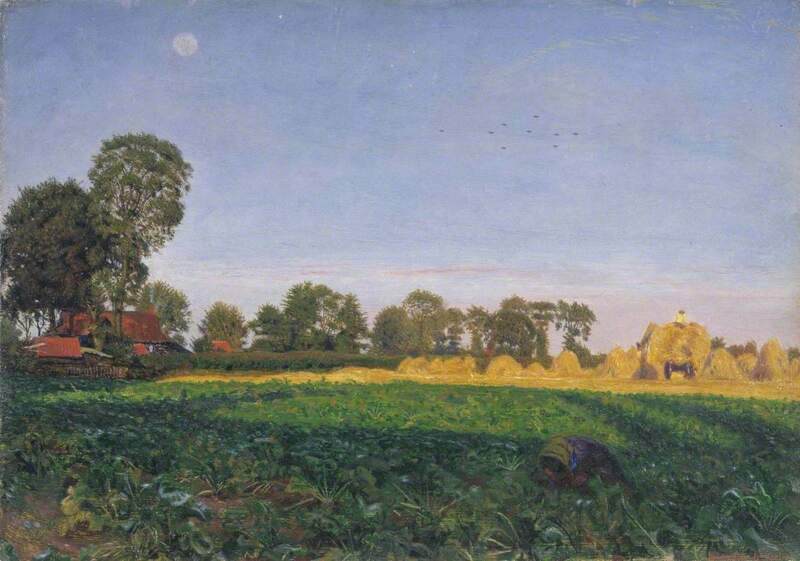 In the finished painting, the colour contrasts and the falling shadows of late afternoon are beautiful, and subtly enlivened by the small flock of birds in the sky, and the tiny figures of the haymakers. There is also a woman, half-hidden in the shaded foreground, bending to pick or gather the turnips. Julian Treuherz tells us that the finished painting was submitted to the Royal Academy's Summer Exhibition of 1855, but not selected, and later sold to a dealer for £12. No wonder the artist grumbled that "these little landscapes take up too much time to be proffitable [sic]" (qtd. in Treuherz 168). But they would find their true value in the end. Ford, Ford Madox. Ford Madox Brown: A Record of His Life and Work. London: Longmans, 1896. Internet Archive. Web. 21 July 2017.